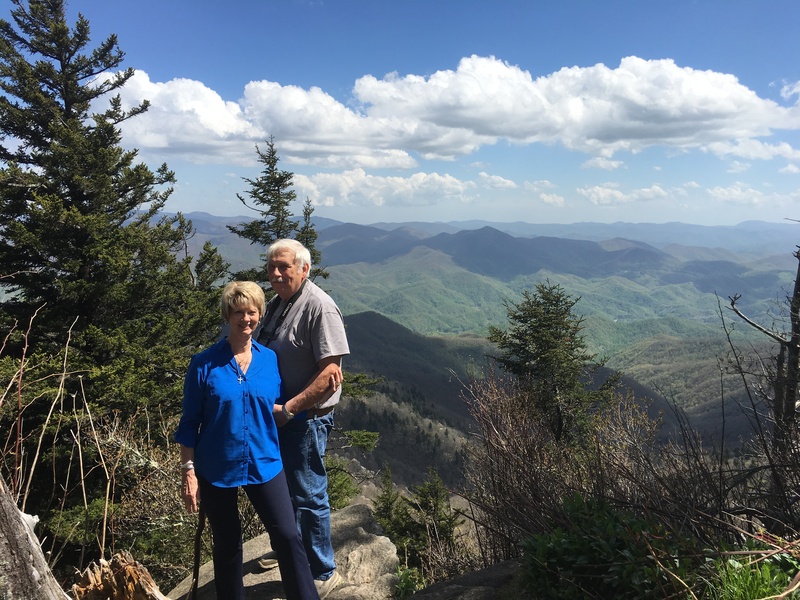 Western North Carolina – Let's Go RVing! 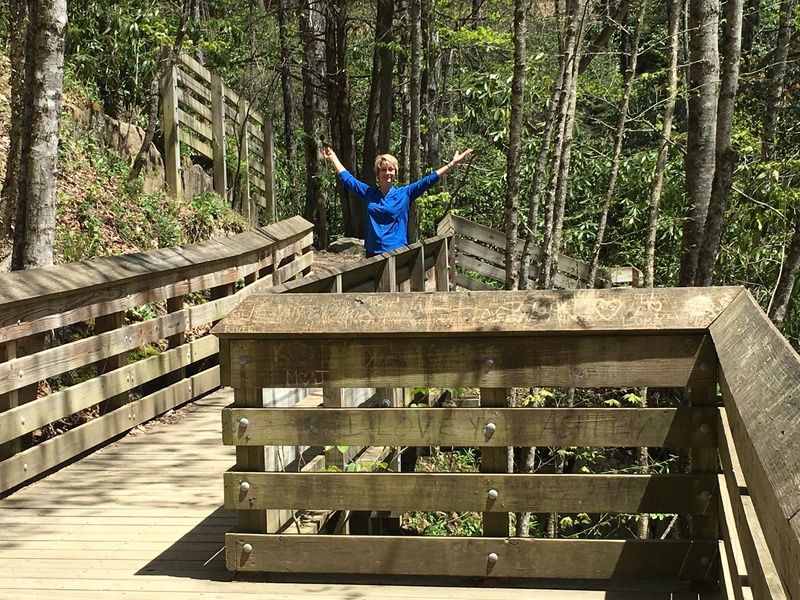 Soco Falls and Waterrock Knob in One Day! Wow – we pushed ourselves today! We started our day headed to Soco Falls but unfortunately we missed the little sign – and it is little – and ended up in Cherokee. Jerry wanted to go to the Cherokee Historical Museum so we decided to go on and do that. That is museum filled with history from the very beginning of the Cherokee tribe. As described on the website “Inspired by the beauty and ingenuity of the Cherokee people, this is a cultural and historical tour without equal, one fused with interactive video, intriguing displays, and a full sensory experience.” When we entered we read a few of the folk tales while waiting for a video. The video told about the beginning of the world and the beginning of fire. The rest of the museum was filled with exhibits and a timeline of the Cherokee. Despite reading the history one wonders why the white man was so determined to eradicate and/or control the Indians. Andrew Jackson before he was president played a big part in their history and then after becoming president he was very anti-Indian. All in all a sad story but a story of a people overcoming many obstacles. Since it was lunch time we decided to have our picnic at the picnic area beside the stream that runs through that park. We had a nice lunch and took a couple of pictures. 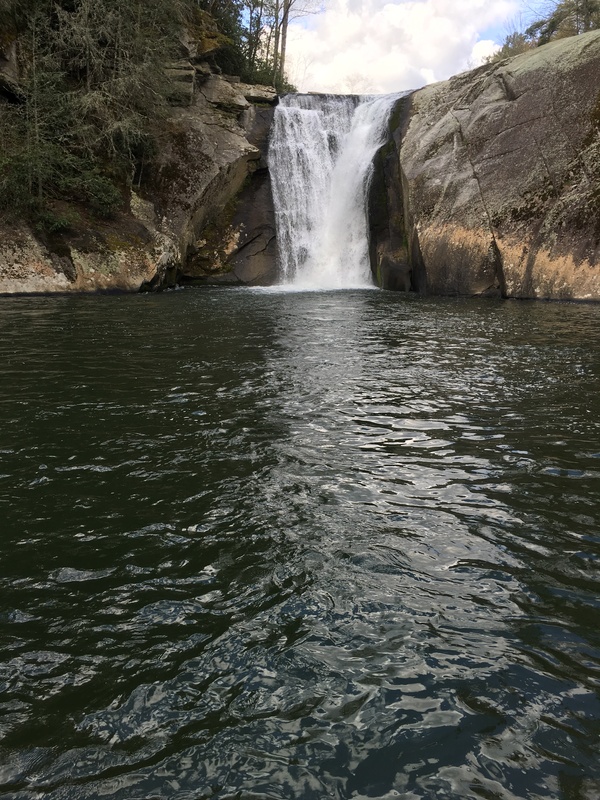 Our next stop was Soco Falls and we were determined to find them this time – and we did. It’s a nice little descent and we thought at that time it was a little much – little did we know what was ahead of us. The double falls are very pretty and skipping over the rocks is fun. We were very careful though not to go in forbidden and dangerous territory. Next we headed for Waterrock Knob. From the parking lot it’s just a short half mile up to the top. Yeah- but it’s a steep, rocky and at times a bit treacherous climb. There is an observation area at the .21 mile and we could have stopped there but we were determined to make it to the top. It was difficult and we had to stop several times. I read later that from Maggie Valley we had gone up 4000 feet in elevation. That’s why we were having a little trouble catching our breath. Well, maybe part of the reason! We made it though and I can say I’ve done it but somehow I don’t think I’ll do it again! It was a spectacular site though and worth the hike. We made it down in 20 minutes, much quicker than we went up! Our blow dryer seems to be on its last legs so Jerry suggested we go by Walmart and get another one just in case this one doesn’t work one morning. I had a short grocery list so we located a local Walmart and went there and got all of the groceries on my list. Yep – we totally forgot the hair dryer. Sure hope ours works in the morning! On Thursday nights some of the campground visitors meet at a restaurant for dinner and the hosts asked us to join them so we did. We got to meet some more of the folks and had a delightful time. Peggy and Tony Auth are the camp hosts and Peggy and I have scheduled a trail ride for Saturday morning if the weather holds. That should be a lot of fun. Tomorrow we’re planning to go to Clingman’s Dome – that is on my bucket list so I’m excited about that. Some of the group went out for ice cream after dinner but Jerry and I were just too tired. I don’t think either of us will have to be rocked to sleep tonight! Today was an exhilarating but exhausting day! We got on out early this morning as we had several places we wanted to go. We didn’t see everything we had planned on but we saw something we hadn’t planned on and that was the best! Our first stop was Elk River Falls. Common sense would say it is in Elk Park but we had a bit of trouble finding it. The GPS said it was in Tennessee which actually isn’t far from here. The cell phones had no coverage so we couldn’t look it up that way. We finally saw a sign indicating Elk River Falls so that’s the way we went. It was a narrow two lane road that wound around and around. I probably would have given up but Jerry said the rustic sign pointed in that direction so on we would go. We were finally rewarded with a small graveled parking lot with one other car in it. After we got out we saw some steps leading to a trail through the woods so off we went. The trail to the top is an easy five minute walk although there are a lot of tree roots to be aware of. Just below the falls is a small sandy area and it looked like it might be used as a sunning and swimming spot but the water was way too cold today for that! Apparently there is good fishing there as well as we saw a gentleman trying his luck. Next we headed for Linville thinking that was where Linville Falls is. I put in Linville Falls Visitors Center in the GPS and off we went. It took us down another narrow two lane road although this one was in better condition. There was a sign saying no exit but we traipsed on. Sure enough we hit a dead end. Fortunately there was a very informative couple who gave us several suggestions on what to see. By the way, there is a road there that apparently leads to the Visitors Center (which we never went to) but the gentleman said it was closed in the 30’s. Come on GPS – time to catch up! The couple recommended Wisemans View and told us how to get there. I am surely glad we ran into them because Wiseman View was the absolute highlight of the day. 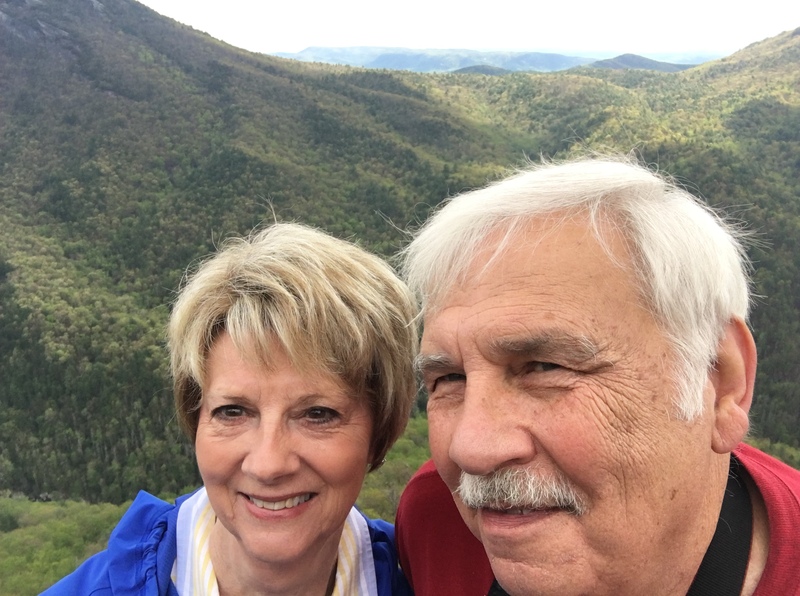 Following their direction we followed route 221 until we got to 183 and then turned and it led us to Pisgah National Forest where Wiseman View, Linville Gorge and Linville Falls are located. When we hit the graveled road we knew we had four miles left to reach the top. We truly did not know what to expect but the bumpy, graveled road ride was worth it. We were told that the road probably would be ok as the season hadn’t started yet. Well, thank goodness for that! It indeed was a bumpy graveled road with a lot of holes. In fact I remarked to Jerry twice that we needed a jeep. He replied that a dirt bike might be a better choice. There were only two places that were really bad and at one of those the bottom of the car scraped the ground. Go Toyota Avalon! The only scary part was when we approached an ascent and couldn’t see over the top of the car. That only happened once though – well twice, once going and once returning! We stopped at an Information Center but it was locked. It did have restrooms though in a nice building but they had porta potties! Guess that’s necessary in that kind of situation. We continued on up the road and soon reached the parking lot for Wiseman View. There is a relatively short path (handicap accessible) that leads to the ledges and incredible beauty. From every view there are stands of green trees and nothing else, no homes, no business, no construction – just nature at its finest. The Gorge is known as the “roughest piece of country east of the Rocky Mountains”. It is too rugged to be used for farming and most of the timber is inaccessible. During the 1920’s there was talk of turning it into a private park or using the Linville River for generating power but those ideas fell through so the Gorge remains wild and beautiful still. The Gorge is home to a variety of plants and trees. There are occasional fires there and interestingly enough there is one pine tree that needs a hot fire to open its cones. The ledges are nesting habitats for the rare peregrine falcons and Jerry actually saw one today. We walked around the top for quite some time but were very careful not to get too close to the ledge as it is very treacherous and a long way down! 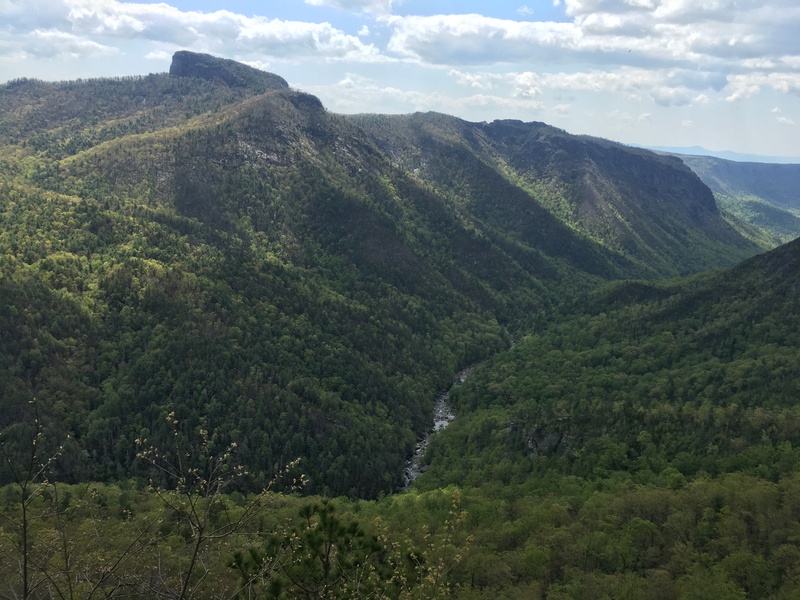 In fact Linville Gorge is the deepest gorge in the eastern United States. 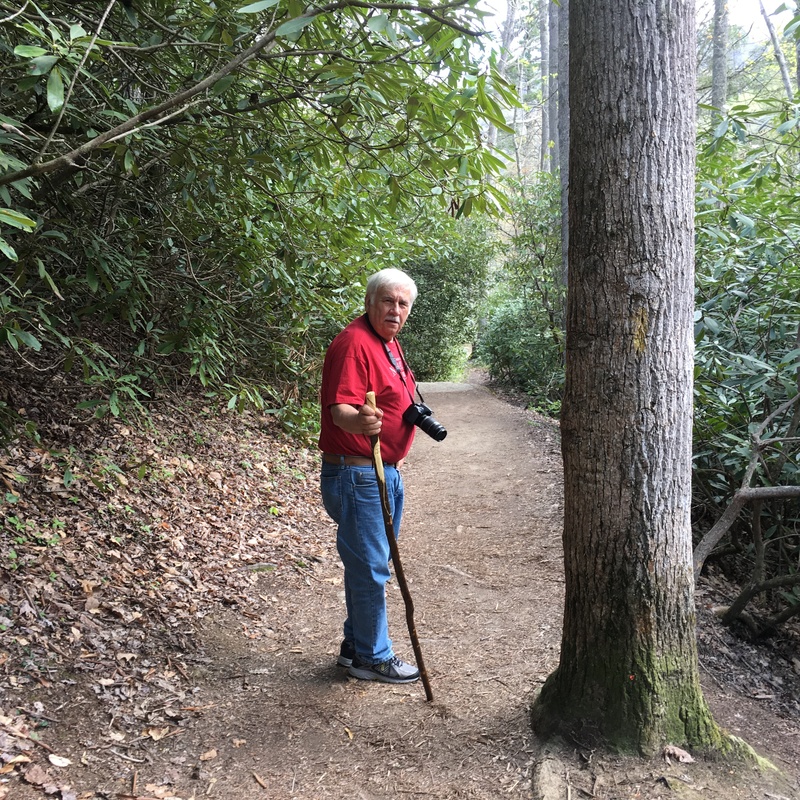 We stopped at Bynum Bluff Trail on the way down and hiked it for a while. We couldn’t see any end in sight so we eventually turned around. We did see lots of pretty vegetation and lovely flowers. In fact we saw azaleas blooming in the wild and I don’t think I’ve ever seen that before. Imagine that they can grow in the wild and I can’t grow them in my yard! We returned to the car intending to get our lunch and find a nice rock to sit on and picnic. Since we were unable to find a good spot we drove on back to the Information Center and just ate in the car. Our next stop was Linville Falls. Once there we had a nice hike to the lower falls. It is amazing to realize the power that the falls produce. There are several trails there but by this time we were hot, sweaty and hiked out so we headed back to the campground via the grocery store. Jerry baked some sausage balls this afternoon and after putting laundry on I took a brief nap – don’t think I would have made it I hadn’t! Tomorrow we head to Trails End Campground in Waynesville for some more exciting days. I have surely enjoyed our time here and would love to return. In fact I told Jerry I had never wanted a house in the mountains but I’m about to change my mind about that not that it will happen but it might be nice. We have only tapped the very cream of a beautiful part of North Carolina – there is so much more up here to see. We are very blessed to live in a state that has such beauty from one end to the other!